Looking to get sports channel ESPN on your Freeview TV set, or set-top box? We’ll provide you with details on whether you can get ESPN on Freeview. Until 2013, it was possible to get ESPN with a suitable Digital TV or Freeview set-top box via a TV aerial. Since BT acquired ESPN’s UK service, this is no longer possible. Looking to get ESPN without signing to Sky? My TV has a slot – Can I get ESPN? 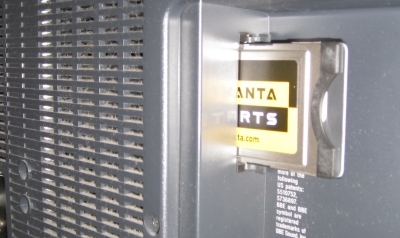 Many newer digital TV sets have what’s called a CI slot. Into this, you need to slide a CAM (Conditional Access Module). Into a CAM, you can insert a subscription card. If your TV has a socket suitable for a CAM and subscription card, then you should be able to get ESPN. Need a CAM and card? Go to www.topuptv.com – Top Up TV manage the ESPN subscriptions on Freeview, and can provide the CAM, card and subscription. My Freeview box has a slot for a card. Can I get ESPN? Probably. While most Freeview boxes are basic, and don’t have a card slot, some do, and unless the box is a very old box, you may be able to insert a subscription card and start watching. If your box is suitable, go to www.topuptv.com and get yourself a viewing card for ESPN. Top Up TV can supply you with a basic Freeview box, the T215. This will be able to receive the main Freeview channels. It has a card slot suitable for ESPN and Sky Sports. BT Vision combines Freeview and on-demand TV… movies and TV shows over the Internet. The BT Vision box is a hard-disk recorder, supports HD films and a decent library of on-demand content. The box supports ESPN and will soon be offering Sky Sports. Currently, ESPN is free if you subscribe to the BT Vision Unlimited package. Go to vision.bt.com for the details.